Here at the Church of Saint Paul, the Family Formation staff is very excited about the Year of Faith and all the potential graces that are just waiting to be poured out onto our families as they grow in their knowledge and love of Christ and the Church He established! 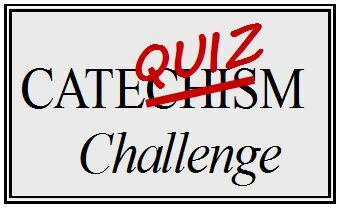 The Cate-Quizm Challenge is designed to encourage parents open their copies of the Catechism of the Catholic Church and get a little more familiar with the beautiful depth of the Catholic Faith. It is accessible to beginners, and will challenge those who are already familiar with the Catechism as well. The details of the Challenge can be found in this post from last week, and since the cards for the year are ready to go, you can print them all from this file. Note: It’s designed to be printed two-sided and will have two half-size cards per page. I’ll be blogging individual cards and the answers (and possibly other updates) throughout the school year, but for planning purposes thought it might be helpful for you to have everything up front. One more thing – I’m sure you’re a bunch of smarties, but as a time-saver having the answers might be helpful as well. Next FF FAQs – What about children who go to Catholic schools?